Scientists say they have definitive evidence for water-ice on the surface of the Moon. The ice deposits are found at both the north and south poles, and are likely to be ancient in origin. The result comes from an instrument on India's Chandrayaan-1 spacecraft, which explored the Moon between 2008 and 2009. Details of the work have been published in the journal Proceedings of the National Academy of Sciences (PNAS). The distribution of the ice deposits is patchy. At the lunar south pole, most of the ice is concentrated in craters. At the northern pole, the water-ice is both more sparse and more widely spread. The Moon Mineralogy Mapper (M3) instrument aboard Chandrayaan identified three specific signatures of water-ice at the lunar surface. M3 not only picked up the reflective properties one would expect from ice, but was able to directly measure the distinctive way its molecules absorb infrared light. This meant that it could differentiate between liquid water and vapour and solid ice. Temperatures on the Moon can reach a searing 100C in daytime, which doesn't provide the best conditions for the survival of surface ice. But because the Moon is tilted on its axis by about 1.54 degrees, there are places at the lunar poles that never see daylight. Scientists estimate that temperatures in permanently shadowed craters at the Moon's poles do not rise above -157C (-250F). This would create an environment where deposits of water-ice could remain stable for long periods. The result supports previous indirect detections of surface ice at the Moon's south pole. However, those results could potentially be explained by other phenomena - such as unusually reflective lunar soil. 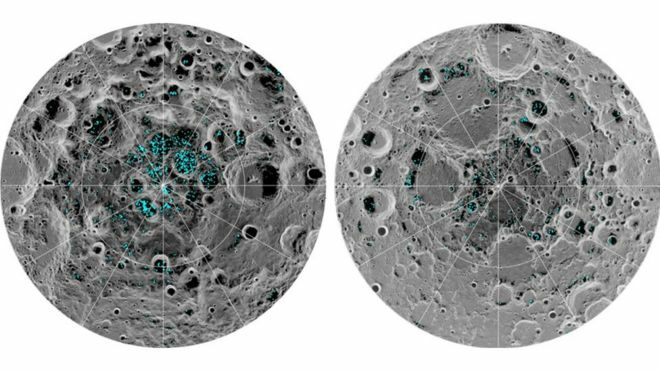 If there's enough ice sitting at the surface - within the top few millimetres - the water might be accessible as a resource for future human missions to the Moon. It could potentially be turned into drinking water for the occupants of a lunar base, or "split" into hydrogen and oxygen for rocket fuel. The split oxygen could also be used by astronauts for breathing. Surface water ice has also been found on other Solar System bodies, such as at the north pole of the planet Mercury and on the dwarf planet Ceres.